I have a very dear friend, who was over at my house one afternoon. We were chatting about what my next project would be. I must have said something along the lines of, ” I am not sure.” To which she responded. “Well, when are you going to change your fan? It doesn’t match .” HA. I love that lady. She was right, it didn’t, but I didn’t think it was absolutely horrendous. Regardless, now, nearly 1.5 years later. 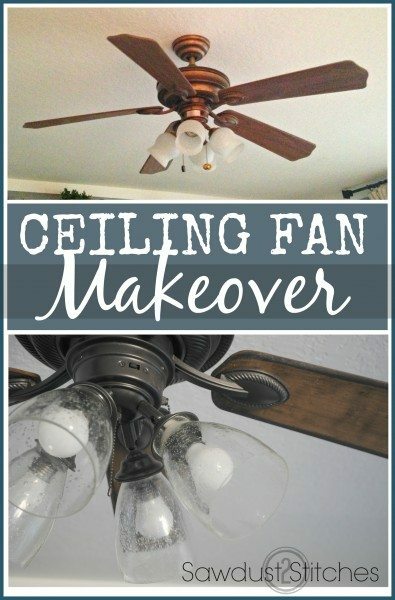 I did it, Michelle, I finally did a much-needed ceiling fan makeover! 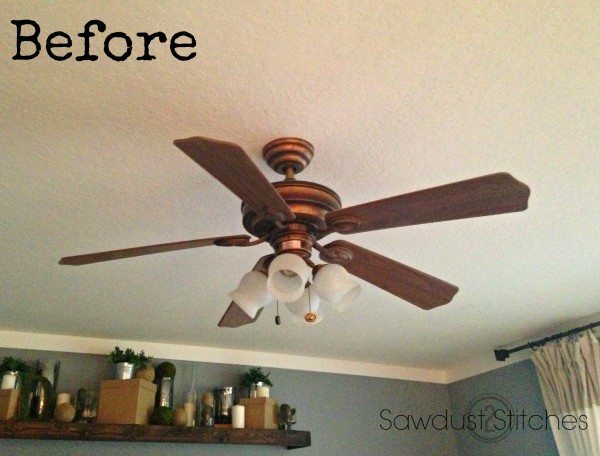 So, let’s dive into this ceiling fan makeover. First step? Remove that sucker from the ceiling. (Unfortunately, all fans are going to vary slightly, so I can’t help much with that part.) 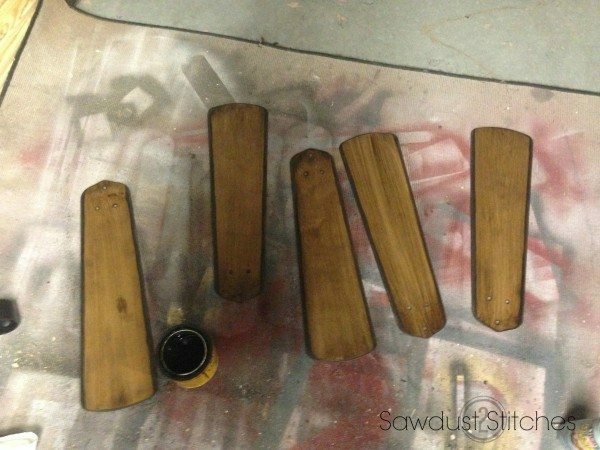 Once the fan was down, I decided to remove, and refinish the blades first. I didn’t really like anything about the fan, even down to the shape of the fan blades. So, I took matters into my own hands. I drew out the new shape on the blades. So I took a jigsaw and chopped off the tips. I used a sander to round out the edges. While I had the sander, I sanded off the finish and prepped it for a new one! I used a stain on the fan blades. 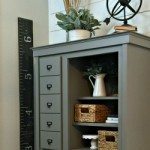 You can use a traditional stain, or you can use a stain/poly blend. 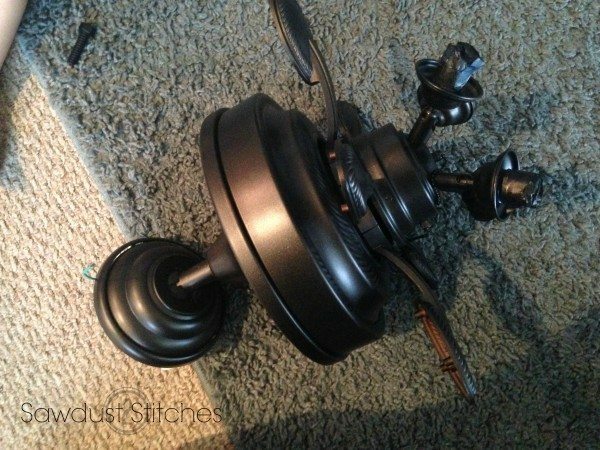 I had to disassemble the entire fan in order to refinish it. The one suggestion I would strongly caution is take pictures of the process! It may help when you put it back together. 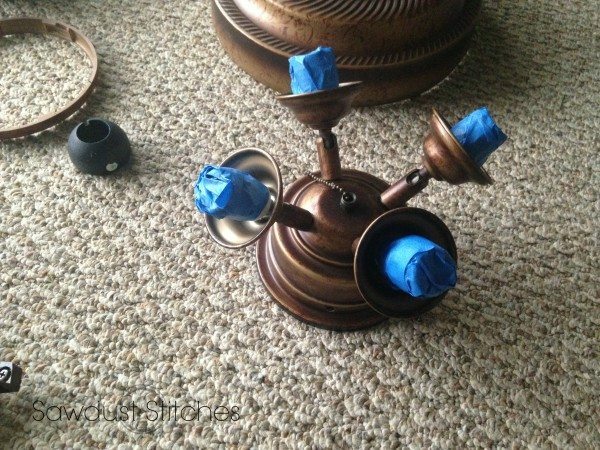 When prepping for paint, I needed to tape off the bulb socket to prevent paint from getting in the sockets. Thoroughly wipe down all pieces and lay them out for painting. Once it is all laid out, I was ready to paint! 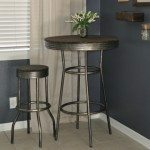 I used Oil Rubbed Bronze Metallic Spray Paint by Rustoleum. Remember to use several light coats, as opposed to one heavy coat. 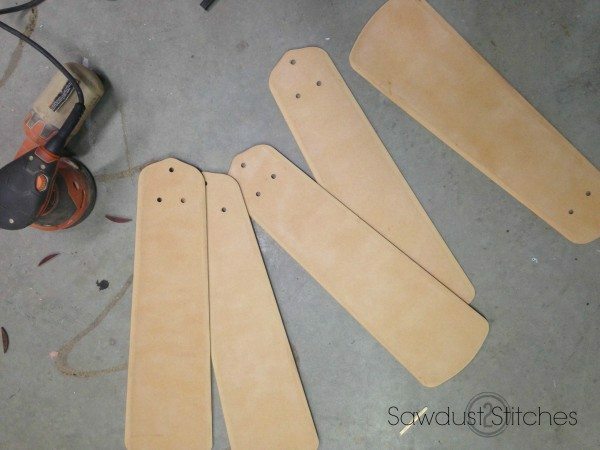 It will harden much quicker, and produce a much more even finish, without drip marks. 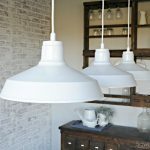 If you feel like you need a little more direction, here is another tutorial where I showed how to refinish a light fixture . Once all pieces are dry, it was time to re-assemble. 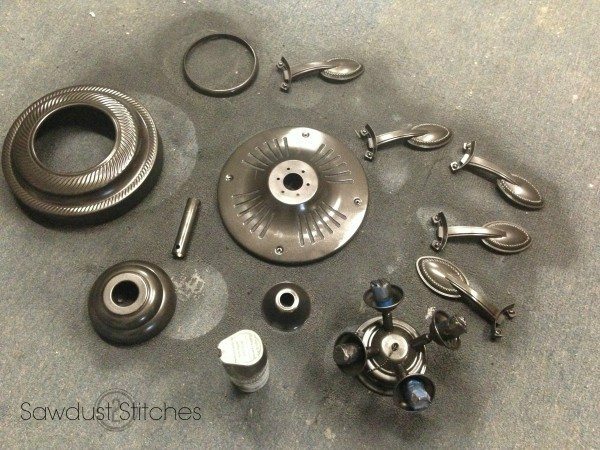 Now might be an ideal time to pull out the pictures of the disassemble process. There, that finish is much more fitting for my space. The last thing it needed was new glass shades. The old ones were very dated. 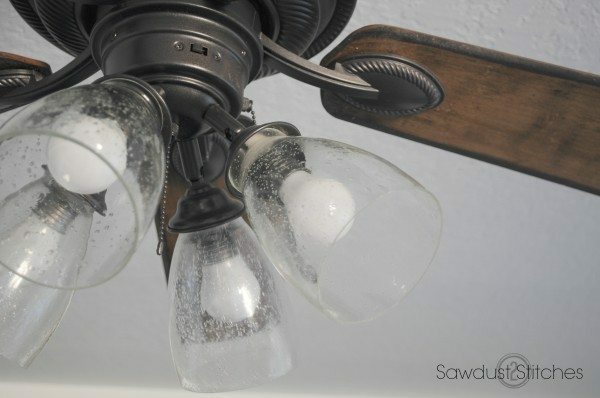 This one simple change drastically improved the whole fan. 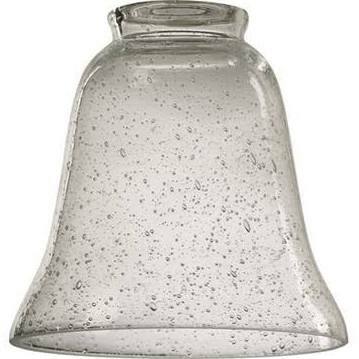 I used “seeded” glass shades. I found mine at Lowes for $3.98 a piece. Not too shabby! I don’t know about you, but I think it was a night and day difference, once I swapped out the shades. Ta-da ! 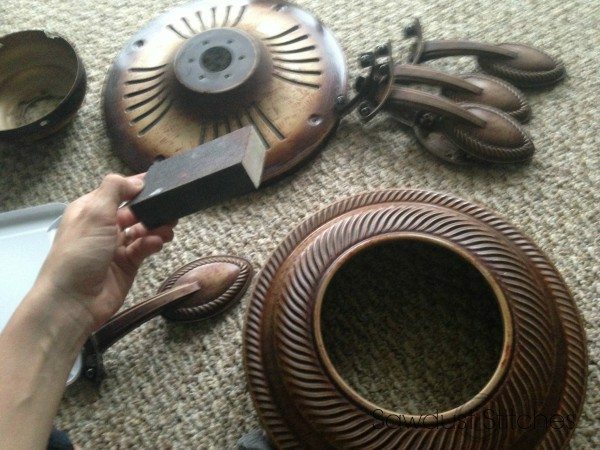 I was able to completely update dated, somewhat ugly ceiling fan . So, look up. 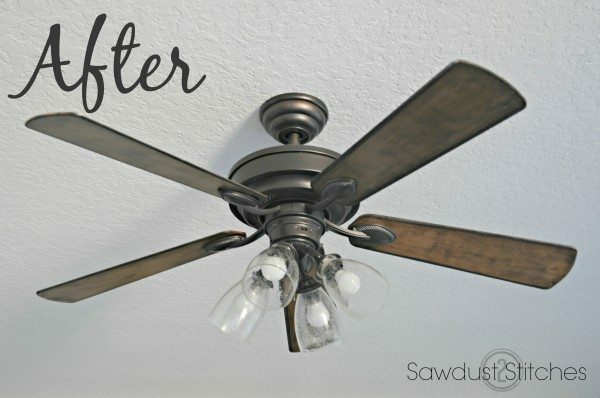 Do you have an ceiling fans that could use and update ? 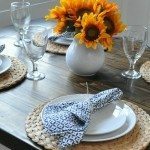 How to: Recycled and reclaimed Farmhouse Table. I love it, it looks fabulous! I have a white fan I have been thinking about redoing. 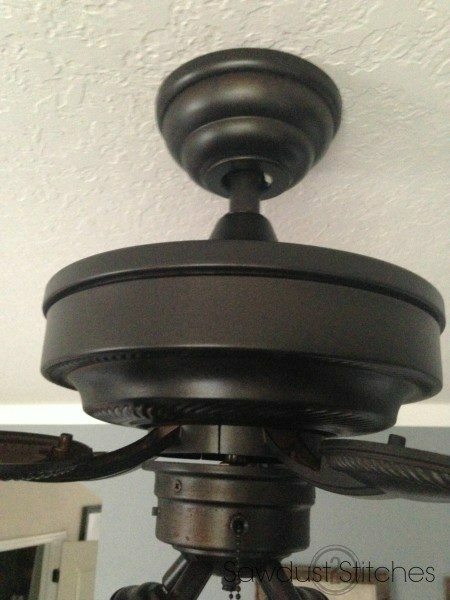 I love how your fan blades came out but how did you get the dark edges? Just a quick tip. You need to be careful when trimming fan blades like this. 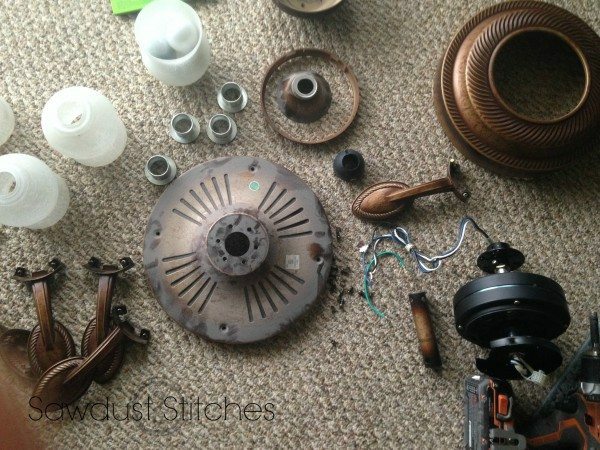 If they are not all equal, it will throw the fan off balance, which will either cause a severe wobble, and/or wear the motor out prematurely. Very good point, I should have stressed the importance a little more in the tutorial. Thanks. Love the way this turned out! I have an ugly white fan I have been thinking about redoing. I love how the fan blades came out too! How did you get the edges darker? Thanks! 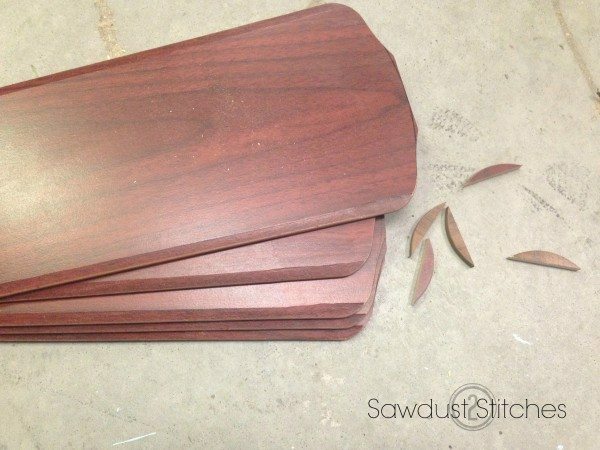 The fan blades were mdf ( not real wood) so when I sanded the edges more, it got down to the more porous material and it absorbed more stain. 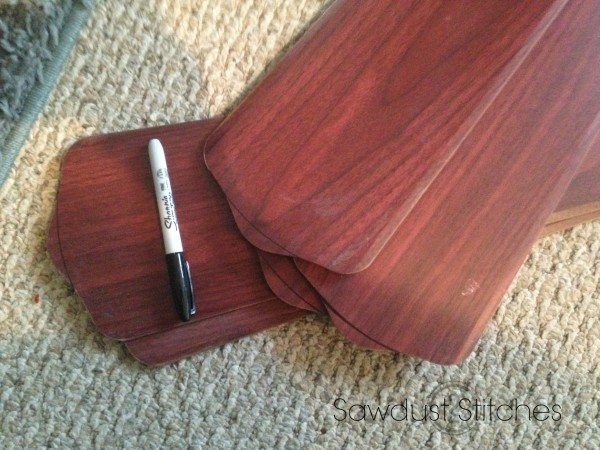 Or you can always layer your stain around the edges and let is sit for a little longer and then wipe off excess. Thanks for reading, and good luck! Cute! One of the things (if maybe one of the very, very few things) I don’t like about Texas is the need for a ceiling. When the mercury hits north of 100 in the summer, we HAVE to use our ceiling fans. I’m always looking for new ways to make them look like a piece of design. Great job (as always)! Hahaha thank heavens for Michelle! 😉 it looks awesome!! 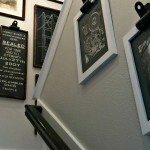 Awesome use of material! As always I love seeing Take Luck at the end of your posts. Thanks Whitney! Haha, are you by chance a Brian Reagan fan ? !